Josi Ezinga is a third year student at Eastern Michigan University. She is a social work major with a political science minor. This is her third year with Cellar Roots and first year as editor-in-chief, and she couldn’t be more excited to see what this year has in store for the magazine. Her favorite books include The Night Circus, The Golden Compass, Moloka’i, and The Bell Jar. Rheanna Reeder is a Junior from Saginaw, MI. She is majoring in Social Work and minoring in Women’s and Gender studies. She discovered her love for writing in the fourth grade and has since developed a deep passion for arts in its many forms that continues to grow to this day. Her favorite authors include but are definitely not limited to Kurt Vonnegut, J.K. Rowling, Toni Morrison, Sherman Alexie, and many, many more. You can usually find her reading, writing, studying (or browsing the internet). or cuddling with her cat, Simone. Abigail Vermeulen studies international affairs with a minor in creative writing. Right now, her passions surround experimentation with autofiction, George Perec, study of the French language, memory, documentary, and water. Tatiaira Herndon is a junior at Eastern Michigan University majoring in creative writing. With a fierce passion for writing, specifically poetry, Tatiaira hopes to someday piece together her own short book composed of a collection of her poems. Apart from writing, Tatiaira enjoys drawing and listening to music on her free time. 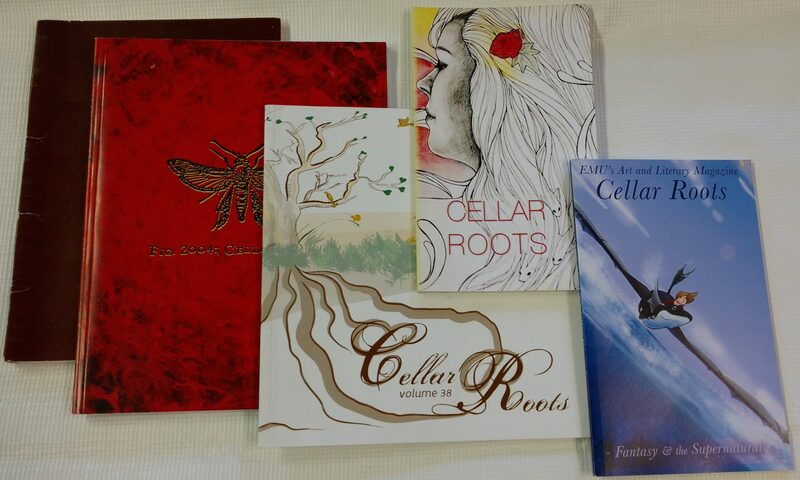 This is Tatiaira’s second year working for Cellar Roots. Lauren Ahern is a Sophomore from Farmington Hills, MI, who is currently majoring in Language, Literature, and Writing, and minoring in Teaching English as a Second Language. One day she hopes to be an English teacher overseas, which accomplishes her two main goals in life: to help other people and to travel. In her free time, she likes to watch movies (especially Disney movies), read, hang out with friends, and exercise. Tiffany King is a third year student from Toledo, OH. She is majoring in Journalism and double minoring in Apparel, Textiles, and Merchandising and Graphic Communication. With a passion for words and literature, Tiffany hopes to get into editing and work for a magazine or publisher in NYC after college. She loves to read, watch movies, eat pasta and chill at home with her dog Gypsy and cat Buzz. Smrithi Srinivasan is a junior and is the Submission Coordinator for Cellar Roots. She is majoring in Management and Computer Information Systems. When she isn’t in class, she’s most likely to be found reading comics or stories, watching animations, or volunteering. Smrithi has always liked to read since she was in middle school and her love of literature grew as time went on. This year, she hopes the new position will allow to see a new side of Cellar Roots like never before.